Greetings from Washington, DC! My name is Tamarah Moss and I am an Assistant Professor with Howard University School of Social Work and an AEA MSI Fellow with experience in program monitoring and evaluation, as well as teaching graduate practice evaluation courses. When I started to work on this AEA365 blog entry, my thought process began with more questions than answers. In raising the issue of cultural competence in relation to evaluation in social work and broader behavioral science fields, the ideas of cultural humility and reflective practice come to mind. Both ideas incorporate a commitment to self-evaluation and self-critique. Hot Tips provided below are to reinforce or enhance your current practice of culturally competent evaluation. How does an evaluator ensure cultural competence, as a general practice in evaluation? To help me think through these concepts and eventual application of cultural competence in evaluation and my overall approach to culturally competent evaluation, it was important to reference the American Evaluation Association’s statement on Cultural Competence in Evaluation, as a good place to start. The idea that “evaluation is not culture free” and also that “cultural competence is not a state at which one arrives; rather, it is a process of learning, unlearning, and relearning. It is a sensibility cultivated throughout a lifetime” are important considerations. As part of my overall approach to evaluation and ensuring cultural competency, statements of professional and accrediting organizations creates an environment of ongoing integration. The Council on Social Work Education guides social workers in terms of evaluating practice and utilization of a multidisciplinary theoretical framework (http://www.cswe.org/File.aspx?id=81660 The International Federation of Social Workers, highlights evaluation global standards for education and training in the social work profession (http://ifsw.org/policies/global-standards). The National Association of Social Workers frame cultural competence in evaluation as the ability to “ensure effectives in serving and engagement of culturally diverse client groups” (p.13). See: NASW Standards and Indicators for Cultural Competence in Social Work Practice. 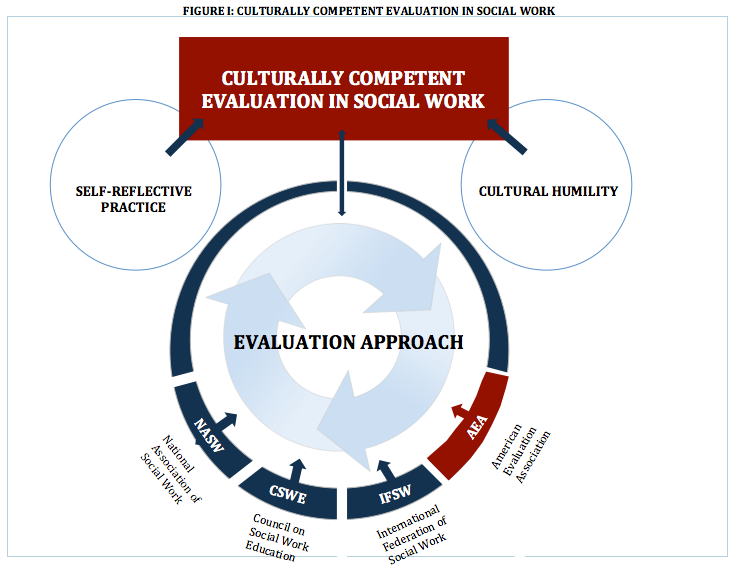 Utilize the conceptual framework of integrative culturally competent evaluation in social work or other behavioral sciences, as illustrated in Figure I below. Determine what the statements on cultural competence and evaluation are for your professional and accrediting organizations. If there are none available, draft a statement with colleagues in the field using AEA’s statement as a framework. Integrate you’re your professional organizations, including the American Evaluation Association’s Statement on Cultural Competence actively into your evaluation practice. Include cultural humility and self-reflective practice into your evaluation approach, as an opportunity to check power imbalances between yourself as an evaluator and the communities, organizations, and the entities being served. Create and support ways to incorporate the perspectives and cultural context of those being served, as part of your evaluation approach. My colleagues and I at CDC’s National Asthma Control Program wholeheartedly concur with your sentiments on cultural competence in evaluation and have developed a practical guide for ensuring cultural competence in evaluation of public health programs. I am including a link to this new resource. AEA’s public statement serves as the foundation of the strategies we recommend. Thank you for your comment and sharing the resource. The thought process for me is one that is ongoing and dynamic as the communities and agencies we work with continue to have unique needs and strengths. Please email me directly at tmoss@howard.edu when you get a chance. The link did not appear on the comment and it would be great example to integrate in my graduate evaluation courses. All the best to you and colleagues in your work.